So you’re preparing to move, and moving time can be stressful! There are many details to remember, and when juggling many details, the timing can be critical. It is important to think ahead about what is needed and about when you should plan or execute your moving checklist items. Are you renting or buying? By this point, you should know which direction you will pursue. Each has different elements in its timeline, so anticipate which steps you’ll need to take according to your own schedule. We’ve provided some examples of timing for each. Buyers: For example, by ten weeks ahead you should have prequalified for a loan and be close to or have chosen your new home. It can take 30 – 45 days to close, according to experts, depending on the loan type and situation. You want to give yourself plenty of time to get through the purchase process and still have time to move. Renters: If you are renting, you will be in a much different frame of mind. By ten weeks ahead, you should be considering which neighborhood you prefer, checking out rental prices in those neighborhoods, schools and school ratings, and checking your credit to make sure there aren’t any surprises when you fill out rental applications. Remember that many landlords will be looking for tenants who can move in as quickly as possible, so prepare yourself financially by having deposit, first and last month’s rent, and an extra month of rent by the time you start applying (around 2-4 weeks ahead of your desired move date), in case you find the perfect place a little early and they are unable to hold it for your preferred move date. Moving arrangements, step one: contact us here at Gigantic Moving & Storage to receive an estimate for your move, discuss payment, schedule your moving date and time, and arrange for supplies. This will help ensure you are budgeting the correct amount, have an adequate number and configuration of boxes, and we are available for you when you need us. Buyers: hopefully you are in the middle of a smooth sales process! Start checking out doctors, dentists, vets, and other practitioners in your new neighborhood. Set up any appointments you need in anticipation of the move, making sure your new practitioners are able to get any records from your old providers. Renters: narrow down your neighborhood list to your top three choices. Make your list of pros and cons about each, including schools, commutes, gym, doctors, and other community amenities, in order to help select the best fit, or if you have multiple rental options in your desired neighborhoods and you need additional considerations to help with the final decisions. De-cluttering, step one: prior to packing, eliminate items you do not wish to bring or have not been using. Sort anything not used in the past year in piles to trash, donate, and sell. With six weeks to go, give yourself three weeks to sell valuable unwanted items. Organizing and packing, step one: if you don’t already keep seasonal items separated, stage or pack everything not being used in the current season. This can apply to clothing, bedding, decorative items, etc. Buyers: if you have children, are buying a house and know where you will be living, start the process of registering them at their new school. De-cluttering, step two: start clearing out that pantry and refrigerator! Take inventory and make meal plans incorporating your food on hand. Avoid buying any additional long-term or pre-packaged goods (pasta, rice, soups or cans, etc.). Organizing and packing, step two: draw up your packing plan, including rooms, color coding, etc. Start packing up non-essential items in each room. Cleaning, part one: locate cleaning companies to help with any move-in or move-out cleaning you will need. Schedule walk-throughs for estimates. If you know your move date, schedule ahead with your preferred provider. Renters: time to give your 30 days’ notice to your current property manager and start submitting applications for new properties in your desired top neighborhood. Buyers: has your sale closed? Double check with your realtor when the closing date will be. Try to make sure it will be at least one week ahead of your move date and that the property will be move-in ready. 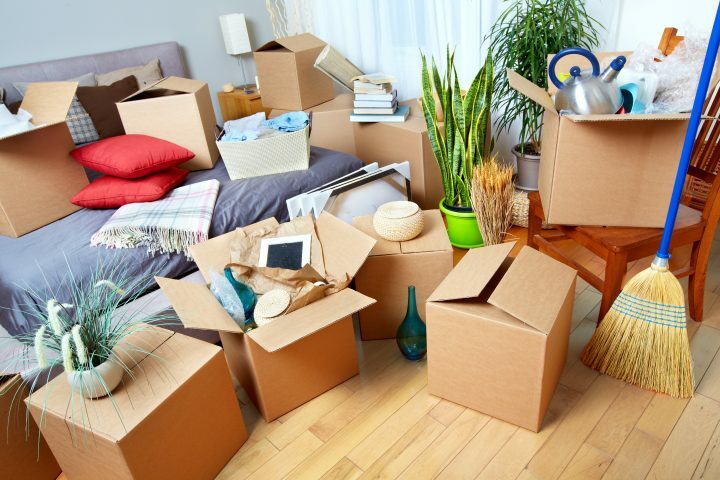 Moving arrangements, step two: If your new place is available sooner than expected, contact us at Gigantic Moving & Storage right away to see about changing the moving date! Work: ensure you will be able to take time off to move. Let them know the dates you will need to miss work, and whether there is any chance the time frame will change. Services, step one: create a list of businesses and services with whom you need to start, stop or change address. Don’t forget banks, credit card, magazine subscriptions, and anyone who would need to have your current address. By this point you should be able to put in service disconnection orders for your current residence. Decide whether you need any overlap in services (for up to a week or so after the move). Remember that most power companies will leave power lines open, but water and garbage services typically stop services on the requested date, which can be important if you need to clean or remove trash. Valuables and papers: gather your valuables, photo albums, small family heirlooms, important documents and anything you may need immediately after moving or need to locate. If possible, store critical small items in a safety deposit box or with a trusted friend or relative. Otherwise, make sure they are in a safe place and you know the location, such as a special bag, box or briefcase. Make sure it is tagged “Important” and “Travel in Car” so it gets sorted appropriately. Services, step two: if you know your move date, start calling to set up services. Particularly in peak moving times, some organizations may be booked out for several weeks to provide installations for new service. De-cluttering, step three: how did your sales go? Hopefully, you made some extra money from your extra items. If not, time to take them to your nearest donation spot. Services, step three: the US Post Office recommends movers submit a change of address at this time. Run through your list of services and make sure you have contacted all of them, including your financial institutions and insurance companies. Now is a good time to review your changing insurance needs, if you haven’t already. License and tax info: search your local county website for information about how to update your address for your driver’s license, vehicle registration, and any tax for property or business. Bills: make sure your bills for the next few weeks are paid in full so you don’t have to worry about paying them during your move. Schedule reminders for any bills you can’t pay in advance, and plan for a way to pay them during your move. Home office, step one: pack up desks and files. Perform all essential computer maintenance, including updates and virus scans, backup essential files, disconnect and pack any unnecessary computer equipment. Moving arrangements, step three: check in with us here at Gigantic to make sure we’re all on the same page, have all the essential contact info and addresses, dates and times are in sync, or if you need any additional moving supplies. Cleaning, part two: confirm or schedule your selected cleaning service provider to help with any move-in or move-out cleaning you will need. Medical: fill any prescriptions you may need. Make sure you have a first aid kit with bandages, antiseptic ointments, pain relievers, and any other handy items. Renters: Schedule a move-out walk through with your leasing agent. Make sure Start checking out doctors, dentists, vets, and other practitioners in your new neighborhood. Set up any appointments you need in anticipation of the move, making sure your new practitioners are able to get any records from your old providers. If you have children, contact schools to set up or transfer registration or provide your new address. Buyers: Your realtor and title or escrow company should have conducted or scheduled your closing, but if not, make sure this happens with enough time to move. Legally, you will not have access to your new property until the closing for your new home purchase has taken place. Home office, step two: pack up any desk top computers, cables, etc. Keep your laptop, tablet, or phone and their cables handy in a briefcase or messenger bag so you have access to them and can bring them in the car when you move. Suitcases: use your luggage to pack any items you or members of your household might need for the next 2-3 weeks, including comfortable moving clothes and essential toiletries. Organizing and packing, final: once your suitcases are packed, finish up any packing that has not already been done. Appliances: disconnect and clean major appliances in preparation for your move. Discard perishable food items. Tape cables, pack or otherwise protect appliances that will be moved to your new location. Financial: withdraw enough cash to pay tips for movers and other incidentals. Make sure your checks and credit cards are in a safe place you can locate throughout your move. De-cluttering, step four: take any last trips to donate items. Dispose of extra trash. Document: don’t forget to record your old and new residences, both for your family’s memories, and for legal protection. Take photos of each room and any damages that are noticeable. Record damage in a safe place and report to leasing agents or realtors. We hope this list has made things easier for you. If you have any comments or feedback, or to schedule your own move, please contact us!